Sale-leaseback real-estate deals are helping more small-business owners make the most of their capital. 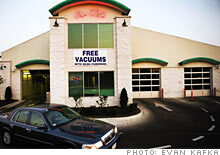 The sale of Diamond Auto Spa's building in Winchester, Va., freed up cash for growth. 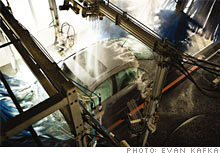 (FSB Magazine) -- Most days, the line of cars at the Diamond Auto Spa in Winchester, Va., stretches around the block. With a 150-foot wash tunnel and a 120-foot conveyor belt for detailing, the car wash took in more than $2.5 million in 2006, its first year - more than CEO Wendell Johnson expected and enough for him to entertain thoughts of a second shop in Front Royal, Va.
Johnson used his savings to fund most of the construction in Winchester - two buildings totaling a tad more than 26,000 square feet, set on about two acres - but he didn't have enough cash on hand to build a second facility. And despite his great start, he could not get financing. "Banks wanted a track record. They weren't very cooperative," he says. Johnson was getting discouraged when a friend suggested a sale-leaseback. That would allow him to sell his buildings, pocket the proceeds, then lease them back. He was vaguely aware of such transactions but never thought they were an option for a small business. Johnson teamed up with Conrad Koneczny, a broker with Sperry Van Ness, a national brokerage firm. Koneczny marketed the Diamond properties to his database of potential investors and located one who was willing to pay $7.5 million. Johnson is now paying $50,000 a month to rent the Winchester facility and is using the net proceeds of the sale - about $5 million - to build in Front Royal. "A sale-leaseback is a tremendous tool for small-business owners," he says. Large companies have used sale-leasebacks for decades to unlock cash trapped in brick and mortar and apply it to more productive uses - paying down debt, buying equipment, or hiring more employees. Small and midsized firms are now seeing the advantages too, says Jon Hipp, president and CEO of Calkain Cos., a real estate investment firm based in Reston, Va. He estimates that sale-leaseback activity among small-business owners in his area has grown 10% to 15% annually over the past two years and expects that trend to escalate. The reasons: Sale-leaseback deals are spreading to all types of commercial property, the Internet has helped business owners peer into the market through sites such as loopnet.com, and, says Hipp, "it's more common to run across someone who has done one." Ken Pachla, CFO of SET Enterprises, a company in Warren, Mich., that manufactures auto components, has used sale-leasebacks several times, recently selling two plants to Austin-based AIC Ventures for $13 million and occupying them under 15-year leases. The proceeds are going toward equipment and new hires. "We felt we could put our money to better use if we used it to grow our business instead of owning real estate," Pachla explains. Sale-leasebacks can be employed to boot-strap businesses too. Mark Parmerlee of Dallas bought the six-restaurant Mexican food chain Jalapeno Tree in 2004. By using his real estate, he has grown the business to 13 stores, with total 2006 revenues of $27 million. He has done eight sale-leaseback deals, raising $13 million to plow into expansion. "It is more attractive for us to take capital out of our existing locations and use that as the equity for other projects," he says. Michael Federman, a New York City - based entrepreneur, even used a sale-leaseback to acquire a business - pulling off a sort of leveraged buyout. He arranged to simultaneously sell the 11,000-square-foot building owned by Larada's Army Surplus in Mesa, Ariz., while he was buying the business, using the $2 million from the sale to acquire the company. He signed a 20-year lease for $180,000 a year. This may be a great moment to think about capturing built-up equity in offices, factories, or stores. Commercial real estate has not yet felt much effect from the housing slump, and the value of buildings in many parts of the country has risen sharply since 2002, producing paper profits that could disappear if the economy slows. Meanwhile, says Koneczny, Diamond Auto Spa's broker, demand from investors for the steady cash flow of commercial leases is as high as he has seen it in his 35 years in the business. With annual returns ranging from 6% to 11%, sale-leasebacks are popular with private equity players, institutional investors, real estate investment trusts, and wealthy individuals. Sale-leasebacks are complex transactions, so the first step is to find a capable broker. Hipp suggests getting referrals from local real estate lawyers, tax accountants, and bankers. Most national brokerage firms employ specialists dedicated to sale-leasebacks and have access to investors. Once ownership changes hands, the seller continues to occupy the space under a long-term lease. The terms vary as to how much control the former owner has and how much upkeep he's responsible for; in a "triple net lease" deal, the tenant picks up all operating costs, including taxes. Because Jalapeno Tree is a triple-net tenant, its monthly operating expenses have remained about the same. But Parmerlee says that his net has improved, and the upside from adding new locations, each of which can spin $2 million in annual sales, eclipses any downside. Deals can be quite creative: Diamond Auto Spa owner Johnson negotiated an option that allows him to buy back, after two years, the Winchester buildings at the same price the investor paid. Leasing may have tax advantages too. A company can deduct all monthly rent and building operating costs as business expenses; owners deduct only interest and operating costs - and must generally depreciate commercial property over 39 years. Sale-leasebacks aren't for everyone, says Stephen Fraser, CEO of ADS Logistics. His company has done several with Boston-based STAG Capital, but he emphasizes the transactions may provide less flexibility than ownership. "If you aren't certain you'll be in the same building long term, you shouldn't consider a sale-leaseback, because you'll end up having to sublease," he says. "Then you become a landlord, which isn't optimal." WANT TO BUY A BUILDING? Ownership has its rewards. Like many investors, Nicholas Exarhos made, then lost, a pile of money during the dot-com boom. After the crash he went the conservative route, investing in sale-leasebacks (along with CDs and pharmaceutical stocks). "They make sense for someone like me who wants safe, low-maintenance investments," says Exarhos, 46, the founder and executive vice president of Axiom Worldwide, a Tampa-based medical equipment manufacturer. Over the past several years, Exarhos has bought and sold 20 sale-leaseback properties through Calkain Cos. His portfolio now consists of 12 sale-leaseback properties yielding 6% to 10% annually. Exarhos buys properties that are leased by strong tenants in improving areas so that he can draw steady rental income and maybe see an upside from the real estate's appreciation. The best tenants, he says, are national chains such as Walgreens, but he also has some small-business tenants. "Sale-leasebacks might not offer the highest returns, but when it comes to safety, they are similar to bonds."